Galvanized gabions ： Box gabions consist of rectangular units, fabricated from a double-twist, hexagonal mesh of soft annealed, heavily galvanized wire. The wire quality and the galvanizing meet all international specifications. The mesh panels are reinforced at all edges with wires of a larger diameter than that used for manufacturing the mesh, to strengthen them and to facilitate construction. 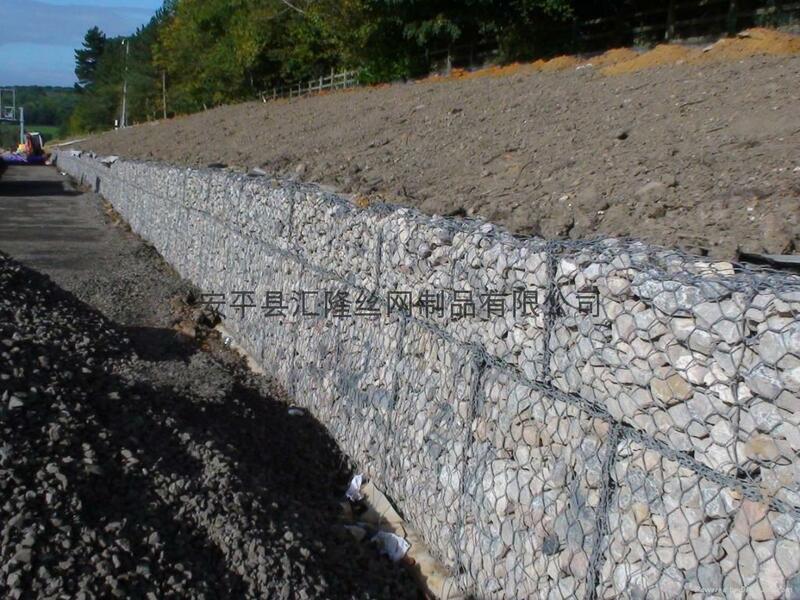 Gabions are divided into cells by fitting diaphragms which have the function of reinforcing the structure and making assembly and erection easier. Galvanized gabions with PVC coating： The characteristics of these products are similar to those of the galvanized gabions; however the wire, prior to manufacturing the mesh, is bonded with a 0.5mm thick special PVC(polyvinyl chloride ) continuous coating. A complete protection against possible corrosion is thus obtained making the gabions suitable for use in marine or polluted environments. Filled with stone, gabions become a large, flexible and permeable building block from which a broad range of structures may be built. * Your other special Specification is available for our factory .